A quiet day in the garden gives one an opportunity to see different birds in the garden, as well as all the wonderful plants. The diversity of the garden, from its carefully maintained flower beds to the arid loving high desert plants in the Lewis and Clark garden make for a great bird habitat. 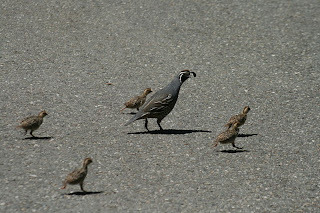 My favorite is the common California quail. Perhaps that is because, like myself, it is not native to Idaho but has found that Idaho is a great place to live. Also because they have that short black feather curving forward over their heads like some sort of fishing lure. In early summer you can watch as a family group goes on an outing. With the parents standing guard as many as a dozen chicks the size of your fist scramble to keep up with the others. As the summer progresses the family inevitably grows smaller but the remaining chicks grow fast. Their dull brown color allows them to blend in with the dirt and gravel, protecting them from predators and garden visitors alike. As winter comes on the quail gather together, forming an ever larger group. By January the group can be up to 25 –50 birds. They explore the same paths every day looking for food. In midmorning their path takes them around our administration building. The group fans out, searching for food. Birds crossing the road or trying to catch up seem to stand on their tiptoes and dash forward as fast as they can. Their black plume always ahead of them.